Detectives investigating the death of a girl who died while practising for an expedition on Dartmoor have ruled out criminal behaviour or negligence. A file on the death of Charlotte Shaw, 14, is expected to be submitted to the coroner within the next two weeks. 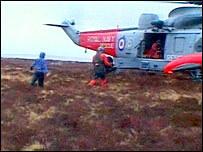 She was training for the Ten Tors event when she fell into the freezing waters of Walla Brook on 4 March. Hundreds of mourners attended her funeral at the Methodist Church in Bideford on Wednesday. Miss Shaw, from Frithelstock Stone, north Devon, was among 85 school groups on the moor training for the Ten Tors. Twenty-six people from three schools - including Miss Shaw's school, Edgehill College in Bideford - were airlifted from the moor in atrocious weather. An inquest into Miss Shaw's death was told she was swept away when she dropped some of her kit into the water and fell in when she leaned over to retrieve it. Members of her school's Ten Tors team joined her mother, Jennifer, family and college staff at the funeral service. Members of the school's netball and gymnastics teams, of which Miss Shaw was a member, attended the service in their sports kit. Miss Shaw's uncle, Jason Shaw, told the congregation: "We want to celebrate her life today, not just mourn her death." He described the teenager as an "energetic, talented, fun-loving smiling character", and told the congregation: "Bury your sadness and make space for the happiness Charlotte brought." Edgehill College's Chaplain, Pastor Dave Wilton, said this was a time of celebration of her all-too-short life, adding that Charlotte "set a fantastic example to us all".